How about papers? There are thousands of fantastic papers available for purchase, but what if you want to save a little money? Here are a few of my favorite sources for interesting papers. 2. Scraps from personal projects, such as Print Gocco leftovers – Save those prints that turned out “bad”, they may make great book pages. Use your own illustrations and drawings to make your book projects perfectly unique. 3. Computer Printouts – Print your own patterns and ruled papers in fun colors. 4. Old Games – Look for games that are full of fun colors and interesting illustrations. 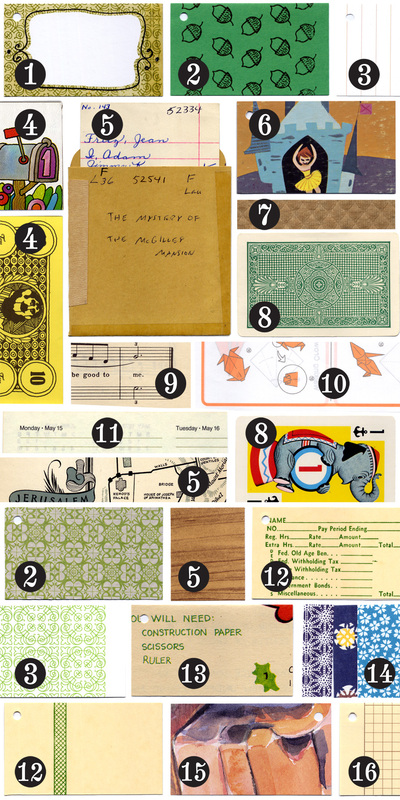 Game boards make great book covers and extras such as play money make fun pages. 5. Discarded Library Books – Most libraries regularly give away old books for free. Use the old covers to use as new books covers, and use the pages and end sheets as inside pages. You might even come across an envelope and due date card, which would be great to reuse as a pocket for your own project. 6. Record Covers – Use this card stock weight paper for book covers or for single sheet inside pages. 7. Everyday Use Papers – I discovered these amazing embossed papers in the kitchen section at my grocery store… they are disposable place mats. Keep an eye out for utility papers that have unique colors or textures. Some other possibilities include butcher paper, brown craft paper, tea bags and coffee filters. 8. Playing Cards – A good way to reuse incomplete or old decks. 10. Instructions – These cool illustrations are from an origami kit. 12. Office Supplies – Look for unique envelopes, forms and ruled pages. 13. Vintage Papers – Keep an eye out at the second hand store for interesting papers. This came from an old craft book for kids. 14. Origami – Pretty patterns at a pretty price. 15. Old Postcards and Cards – This is a good way to reuse papers that you may otherwise throw away. 16. School Supplies – Look for a variety of ruled and grid papers. You are currently browsing the Erinzam News weblog archives for August, 2008.